Inspired by 52 Cups of Coffee, I’ve set out to meet & interview entrepreneurs and small business owners doing their part to help people on their journey to health. Whether it’s over a cup of coffee, tea, a smoothie or kombucha, I want to meet the folks encouraging positive change in their community. This is the third in the series. Check out the previous posts with Jesse of Jesse Lane Wellness where we talked nutrition, engineering & cookbooks and my time with Chester discussing the launch and growth of Fuel+. Do you know someone I should meet? Leave a note in the comments below. I sat down my with my friend and colleague Pier to talk about the launch of his company GreaterGoods.ca. 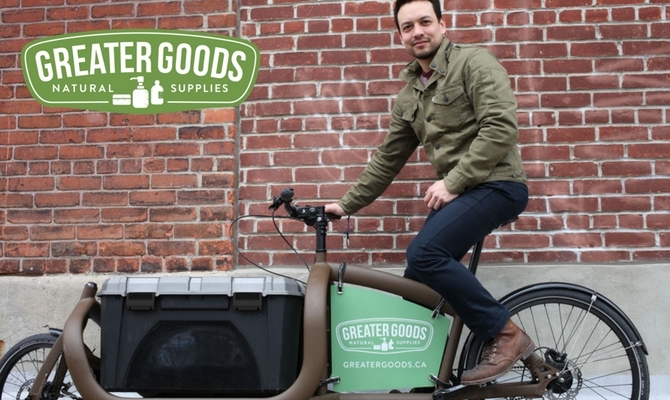 Pier: GreaterGoods.ca is an online retail shop that focuses on environmental stewardship, so we are doing carbon neutral delivery, next-day bicycle delivery while supporting local communities. We sell natural products: personal care, home care and baby care products to our local downtown Toronto community. H: Everyone that I know in the health & wellness space has a story, the story about how and why they got into this business. What is your story? P: It’s a combination of a whole bunch of different things. Years ago I went to the Environmental Film Festival held by Central Tech and was educated about natural products. At that point we made the switch to making our own products and were more aware of the toxins in conventional products. At the time I was doing web design and wanted to get out of it, and I have a background as a bike courier, so I knew next-day bike delivery was feasible in the city. I combined my web design development experience, my knowledge of natural products and my history of bike couriering to GreaterGoods.ca. H: You talked about your experience as a bike courier and in web design. I know you and I’m aware that you’ve had a couple of other careers under your belt. Talk to me about this world of entrepreneurship that you have always lived in and how it translates into what you want to do with GreaterGoods.ca. H: Okay, let’s list them. Selling eyewear, Audio Engineer, Bike Courier, Web Designer. What else? P: And GreaterGoods. I’m sure there are some other ones. H: Didn’t you make music of some sort? P: Yeah, yeah. I was a DJ and a music producer. H: What did you go to school for? P: Audio Engineering. I applied that a little bit. The recent change was more, trying to be honest actually. I was doing a lot of work for toy companies and I was looking at the impact that these toy companies were having on the environment, that was part of it. One toy in particular was essentially licensed plastic, and they were producing hundreds of thousands of these things with distribution around the world. I was looking at that and was horrified by the impact, and I wanted to move to where we were doing something better for our environment. H: Let’s talk about being an entrepreneur and a business owner. If someone wants to do what you’ve done, move away from working for the big companies to being an entrepreneur, what advice would you give them? What is the one thing you would say to someone who wants to make the transition? H: That’s a common thread. People often say ‘never quit your job unless you have money in the bank’. P: Yes, it’s true. If you are unhappy doing what you are doing, go for it, find something happier. H: And find something fulfilling? H: Do you find GreaterGoods.ca fulfilling? H: Do you think this it your ‘it’ or is this your ‘now’? P: We’ll see….it’s definitely going to be an offshoot. It’s definitely going to be related. I’ve found something that makes me happier, to be working in that world. H: You talked about the film festival at Central Tech which really made you stop and take at look at your use of products, and prompted a change in your own life. What do you think is one thing that someone can do now if they really want to make a similar change but they don’t want to be overwhelmed by throwing away everything they currently have. P: There’s not one thing. I was at a conference recently and one of the things they said was if you were going to do one thing it would be to put pressure on the government because switching your shampoo or conditioner or moisturizer in our modern world will have minimal impact. It will have impact and it’s one thing you can do to make your life better, but you are still looking at issues of processed food, you are still looking at carcinogenic flame retardants in your couch that are mandated to be there. If you are trying to eliminate VOCs and you are trying to move away from these toxins there’s not really just one thing. H: You’re right, there isn’t just one thing but as a starting point? P: The one thing would be open your windows and dust more often. Second thing would be looking at yourself, looking at your consumption and if all these things are necessary, look at ways to reduce and ways to move to better products for your life. H: GreaterGoods.ca carries mostly personal care products, is that a place to start? P: Both really. Personal care products that you are actually putting on your skin, but then there’s home care products that you use to wash your clothing, wash your dishes, wash your floor so you are in this contained environment with these toxins. I can’t prioritize personal care or home care. Out of the three that we carry I would prioritize baby care because they are the most vulnerable. H: Looking back on your journey, is there anything that you would change? P: There are some things I underestimated. I definitely underestimated the need and the power for marketing, what we can do now is exposure is democratized. We can reach out and get the same channels more or less as the big brands. We can reach out and connect with people in ways we’ve never done before, almost in a more agile sense than the big brands. That’s we we’ve got to combat. When you look at the big brands, they are a monolith. They rule when it comes to advertising, they are everywhere. They put more money into the advertising and marketing of these products than they do the actual products and ingredients themselves. 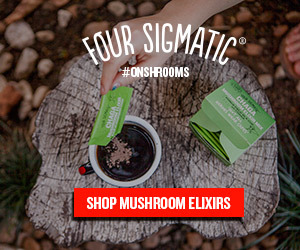 With natural products there is a lot less marketing. I read a quote today which is amazing “the money is the fuel for social change”. We’re making money to influence that change but it’s not the main goal. That fundamental shift represents huge change in how the products are marketed and how the products reach people. It all comes back to the need for marketing, how we can do that as cheaply as possible and possibly get as good of a reach as a large major brand. H: When people talk about healthy, often times they are talking about food. As a Holistic Nutritionist I look at someone’s entire life – mental health, spiritual, the products you use and the products you consume, everything around you. In terms of your world and the world of GreaterGoods.ca, what is your one daily healthy habit? P: When it comes to health, the great thing about the goods we sell at GreaterGoods.ca is that they integrate into your life, so it’s not just one thing that I do. By choosing these products I’m being better to myself without even being consciously aware of it. One of the biggest challenges about these products is that people say ‘oh, this gives you cancer, that gives you cancer’ and what we’re fighting with that is that no, this product doesn’t necessarily give you cancer but it’s a lot better for you, a lot better for your skin and they [the manufacturer] didn’t cheap out on ingredients. H: There’s so much fear mongering, and you could probably find something wrong with all products out there, even the most natural. P: I was doing research and I came across this ridiculous video about how your soap may be killing you. Full on ‘Your Soap May Be Killing You!’ and I was just like, what the hell? There’s fear mongering on every side. If you can’t pronounce it then it must be bad for you, which I think is doing more damage than good. Initially you raise awareness, but in the long haul it can do more damage than good because a lot of that stuff is easily disproven and ridiculed, and it casts a negative light on a good initiative. On the other hand there’s greenwashing where you have non-natural products being marketed as natural, doing whatever they can to beat the guidelines and get pseudo-certified in order to present to consumers a product that is not in their best interest. H: That’s a great point. When you talk about marketing and words like ‘natural’, some of these words are not regulated so any company can use them as a marketing tool. So, how do consumers know the difference? P: The challenge is there’s no real way of knowing the difference. The products that we sell at GreaterGoods.ca are all certified, there’s some that contain varying degrees of organic and fair-trade ingredients, but when you get into the world of certification the cost of entry to certification is quite low, to classify a product as organic it has to have something like 30% organic ingredients which to me doesn’t sound organic. H: It’s a challenge for consumers to figure out what to buy. With a company like yours, you rate all of your products so you’ve done a bit of the homework for us. P: That was the intent. I’ve been to health food stores that carry products that won’t be allowed into GreaterGoods.ca. We wanted to create a safe haven where every product you choose you’ll know is good because we’ve done the research and we’ve vetted everything. H: You’re allowing people to build a relationship with you, a local company, and trusting that you’ve done the work so we don’t necessarily have to. P: Right. None of our products have been tested on animals, unfortunately with the ingredients some of them have been if you look at the industry of ingredients. We carry a brand called Weleda. They stipulate that they never test on animals but the ingredients at some point unfortunately have been. What’s interesting right now is that there are these large companies that claim they don’t test on animals but the irony of it is that they are actually testing on humans because they are releasing ingredients that have not been tested or certified by Health Canada. Then there’s bioaccumulation. Health Canada says X is the minimal allowable portion of a certain ingredient that is allowed in the product but you are exposed to 30 or 40 products that have that ingredient in it before you leave the house in the morning. It’s the same predicament with plastic bags. I’ve seen people get a chocolate bar and ask for a plastic bag. I mean, it’s already wrapped you don’t need another wrapper! They’re probably going to make it 20 feet before they start eating that chocolate. We’re obsessed with the single use items and it’s causing so many repercussions. H: You know you can’t talk to me without talking about food. I suspect that someone like you, concerned about the products you use, are also concerned about the products you consume. I think everyone has their, what I call ‘worth it’ foods. It may not be the best thing for you but it’s the most delicious thing and you will eat it every so often because you love it that much. What is your ‘worth it’ food? P: That’s a hard one. It’s hard because I generally don’t eat out, I eat at home a lot. We buy beef from a butcher up north, we get our vegetables from a CSA. H: You can’t be perfect! My ‘worth it’ food is fried chicken. P: The thing is I’ve drastically reduced sugar so I don’t have that craving. I used to crave pizza all the time. H: What’s the best thing you’ve done for your health? P: To be honest, stop drinking coffee. H: Tell me about that. P: When I worked at CBC I used to have a coffee at 8 o’clock at night with a chocolate bar. I come from an Italian background so not drinking coffee, I’m the black sheep of the family, because I can’t drink espresso. I can drink decaf. Coffee, it’s like full on Trainspotting, withdrawal symptoms within 20 minutes of drinking coffee. H: Is there anything that you want people to know about GreaterGoods.ca? P: One of the things people find interesting when I mention delivery by bicycle is that as the owner of GreaterGoods.ca I have an affinity for cycling infrastructure. What I really love is the ability for cycling infrastructure, and we’ll see it with Bike Lanes on Bloor, to bring a community together. We agreed that we would always deliver by bicycle and we’d do everything locally, because shipping laundry detergent to Vancouver makes absolutely zero sense. We’re trying to grow the local community…we feel things like pedestrian zones, cycling infrastructure, reducing the reliance on cars is a big part of what we do but not necessarily something that’s known about the company. H: It’s a passion of yours that you’ve brought to GreaterGoods.ca? P: Yeah. It’s not the core message but we want people to know that this is why we deliver locally and why we deliver by bicycle. Even if we were going to start shipping we’d ship locally as well, not across the country.